Many Rafflesians fondly know of Yuan’s Western Food as the stall that remains open till 7 pm, providing them with much-needed sustenance for their mugging marathons or CCA activities. Fewer Rafflesians, though, know that Yuan’s Western Food is by far the oldest stall on campus, and has been in existence since RJ’s first year of operation. As part of Appreciation Week, Raffles Press headed down to speak with the sprightly man behind the counter, 60 year-old Mr. Seow Wei Ngen, to find out more. Yuan’s Western Food was the brainchild of Mr Ngen’s mother, who founded the stall as an assurance for her daughter’s future. It might be surprising for many to learn that this initial foray into the food business was started by selling porridge, rather than Western food. With the sale of the coffee shop her porridge stall was housed in to a developer, Mr. Ngen’s mother was forced to relocate, and she finally settled on opening a stall in RJ – then located along Paterson Road. Having honed her skills at dishing out Western cuisine during a stint as a canteen worker for an alumni association of doctors, Mr. Ngen’s mother felt confident enough to start up a stall dedicated to selling Western food. Thus, Yuan’s Western Food was born over 30 years ago, and shifted with the school from the original RJ Paterson Road campus, to Mount Sinai, and finally to its current campus near Bishan. Mr. Ngen picked up his cooking chops from his mother by helping her on and off – he could not commit to the stall permanently then as he was also juggling a job as a coach driver. When his mother and sister could no longer manage the stall, he and his wife, Mdm. Soong Mui Ying, took on the mantle of running the stall on an almost full-time basis (for Mr. Ngen still takes on occasional assignments as a coach driver). 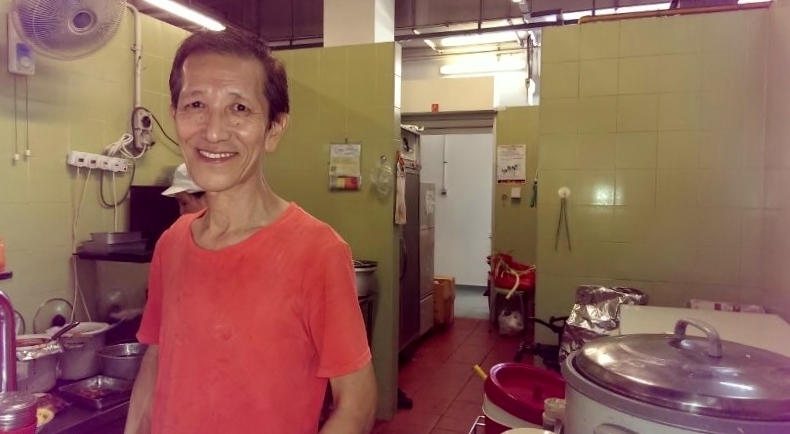 As of the present day, the husband-and-wife duo have been the faces of Yuan’s Western Food for 7-8 years – certainly an impressive record considering the rate at which some of our canteen vendors move in and out. The friendly stall-owner feels that his stall’s cuisine distinguishes itself from the similar fare whipped up by the other canteen stalls by the fact that he sources for ingredients, such as popcorn chicken, from relatively high-quality suppliers. Even as some stalls have added similar items to their menus to draw customers, Mr Ngen has not been tempted to mirror his competitors’ rather unscrupulous business practices. The jovial couple’s long years of service in the school have undoubtedly contributed to the school culture significantly, with many students and alumni acknowledging both them and their scrumptious offerings. In a heart-warming anecdote, Mr. Ngen mentions how 3 to 4 years back, a group of students celebrated his birthday with him by purchasing a cake for him, taking photos with him and making a card for him. Mr. Ngen is compassionate and empathetic to students as well; “I treat the students like my sons,” he shared, and later recounted how he regularly gave a student discounts when the student revealed that his pockets were tight. However, he was deeply hurt by how the student later showed a blatant disregard for his kindness by making rude complaints about the price of his food. Nevertheless, this particular experience did not cast aspersions on Mr. Ngen’s views of the student body in general, and his care for Rafflesians’ well-being remains of paramount importance to him. This is best evinced by the fact that despite rampant inflation having occurred over the past few decades, the prices of his food items have remained relatively constant. “20 years back, (we ordered food for) 50-100 dollars. Now, (it’s) 700 dollars!” he exclaimed. One of the more personal things he revealed was that he enjoys interacting with his children, but he lamented that as they are “all grown up, they can’t go out with me.” In his spare time, Mr. Ngen also finds entertainment in watching television shows such as police and fighting dramas. Ultimately, what motivates him to spur on in his job is the students and his mouth-watering dishes. His fondest memories about RJ remain encircled around the students who patronise him everyday, so remember to thank him for the food he tirelessly provides you with. The next time you visit his store, just remember that behind that counter is a man who sets rigorous standards for the quality of his dishes and is more concerned about us students than his business’s profits. Do give him a smile when patronising his stall, because sometimes, a smile is all someone needs for the day.